Once you being using VS.NET 2010 as a VB.NET user, you will soon see the neat feature of Auto-Properties which C# users have enjoyed since VS.NET 2008. I will not go too much into them as the feature has been covered exhaustively across blogs and sites. In a nutshell the Auto-Property feature provides a short hand way of defining properties without having to fully write out the Get and Set code, along with the backing variable. But what if you do need a more advanced property, where the data is manipulated? How do I get back to the more explicit long-hand format of a property if I need it? 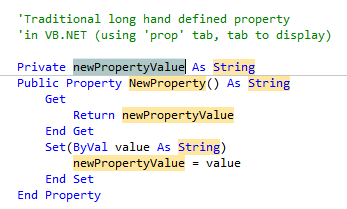 At least in VS.NET 2008, after finishing the definition of the property and its type and pressing <enter> the template was generated for me, so how do I recreate this in VS.NET2010?